This could be an interesting book for animal art lovers. 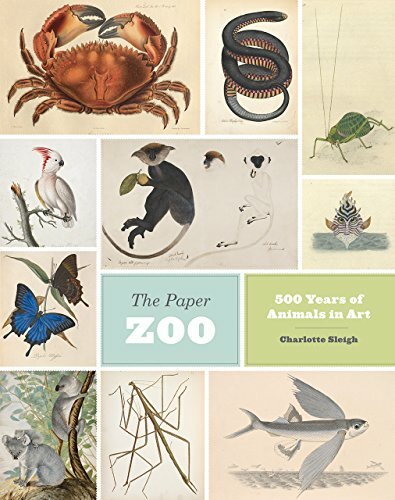 The Paper Zoo is a 256-page hardcover that features animal art that goes back 500 years. Just like a zoo, the book attempts to show you as many variety of animals as possible. The content is split into exotic, native and domestic animals. There's also a pretty lengthy introduction that talks about the history of animal art, the challenges to draw them, especially before cameras were invented, and the educational aspect of such visual documentation. The artworks look great. They are mostly drawn in fine detail commonly seen in botanical artbooks. Most are coloured pencils if I'm not wrong, some painted and a few pen an ink. But most artworks are in colours. The style is a bit more illustrative rather than realistic but of course they are still based from real animals. Each illustration is credited to the artist and there's also a short artist profile provided. This book can serve as a helpful reference for artists who create animal art because there are lots of wonderful examples featured. It's also quite an impressive book considering the amount of work that's required to locate, scan and reproduce old animal artworks. Looks as if most of the color pictures are watercolor and the black and white ones are engravings or hand colored engravings. What a terrific book, thanks for profiling it.